One of my most enjoyable experiences of eating wagyu beef was a few years ago at Per Se, the New York City outpost of the illustrious chef Thomas Keller of French Laundry fame. The experience left me gasping. Deliciously fatty and tender, it was the most gratifying of oral experiences. Growing up in Australia, I was particularly proud that the wagyu was of Australian origin, but thereafter it prompted my boyfriend at the time to affectionately bestow the nickname of wagyu (Australian cow) on me. Well we are no more, and I have had wagyu many times since, including notably at one of London’s best Japanese restaurants, Umu. However nothing had ever come close to being as divine as that time at Per Se which will forever be etched deep in my memory as one of the most memorable dining highlights of my life. For tonight’s dinner I chose one of the restaurants in the Grand Hyatt Hotel in Jakarta: the Grand Café. Essentially a buffet restaurant with a large capacity to feed the masses, the decor was designed for such a purpose in the style of unpretentious comfort. For about £12 it was also possible to have the buffet which appeared to be quite varied with seafood, Western and local dishes, and scrumptious looking desserts. Wines appeared to be available although these weren’t listed on a drink menu, which instead included soft drinks and cocktails. However what had drawn me here was the wagyu beef rendang. Wagyu is such a fine piece of meat that to me it should be cooked medium rare. 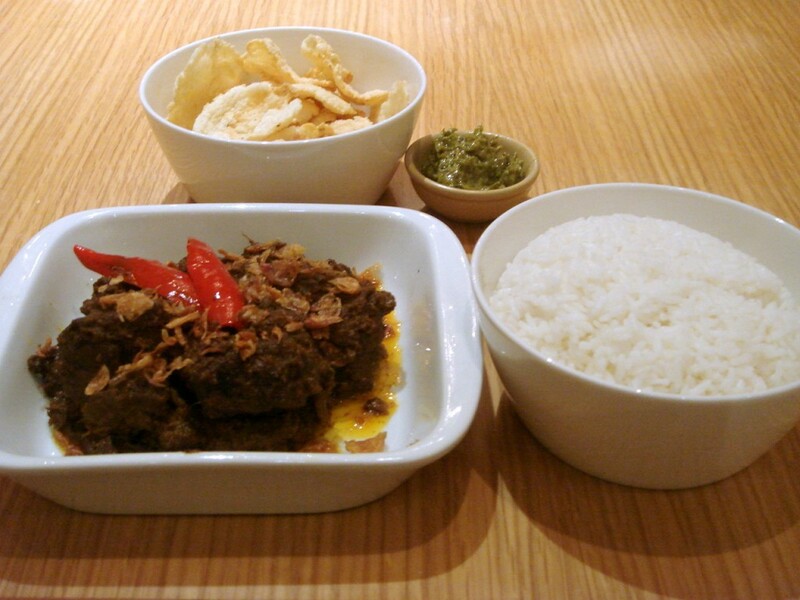 I was intrigued by how this dish would turn out as rendang involves the meat being slow cooked for several hours in coconut milk and spices till the spices are absorbed. However, with such a fine piece of meat, and rendang being an Indonesian specialty, I was hoping that the combination might unexpectedly work. The flavour of the rending was not particularly spicy and quite fine in texture. Garnished with slivers of deep fried spring onions there was a nice crunchy finish to the dish. I had expected more burn but undoubtedly the lack of fire was to accommodate foreign palates. The beef was tender and flavourful, leaving a pleasant aftertaste, but a little dry, and whilst you could tell that it was a good cut of beef, it didn’t really distinguish itself as wagyu. This took me back to my original conclusion, that wagyu is best served medium rare. Priced at about £15 including service and taxes, it wasn’t as good a value as the buffet either, even if the service was friendly and pleasant. No matter. These things are for trying and I’ll always have Per Se.